Each child carries in his or her hand a little basket, and these baskets, which contain the eggs for the great egg-rolling festival, add not a little to the picturesqueness of the scene. The baskets are of all sorts, shapes, and sizes, and some are not baskets at all, but boxes of wood or tin. But most children carry little wicker baskets, big enough to hold ten or twelve eggs, and painted in brilliant colors. With the eggs thoroughly hardened by constant boiling and careful dyeing the children sally forth to the White House to try their skill. There are no complicated rules to control the game, and no referee is necessary. It is a free-and-easy, go-as-you­ please contest. The object is to obtain as many eggs as possible. This end can only be achieved by the hardest eggs and con­tinuous fighting. An opponent is selected and challenged. The challenge is accepted, and the eggs are started rolling down the grassy incline until they collide. By the impact of the collision the weaker egg is invariably injured, and is forfeited to the possessor of the undamaged one. It is, there­fore, simply a question of the survival of the fittest, or, rather, of the hardest. The sport is sublimely simple, but nevertheless wildly exciting. To see one's favorite egg career­ing madly down the. slope, wobbling from side to side, and taking perilous jumps over the uneven ground, gradually travelling closer to the opposing egg, the movements of which are as equally uncertain and eccentric, causes fluctuations between, the sensations of highest hope and deepest despair which are said to be delightful in the extreme. It, is no wonder that egg ­rolling is popular. Whether one is victor or vanquished, the excitement has been obtained, and although the spoils of war always add to the pleasure of a contest, after all the fun's the thing. Thus is performed today the revised version of a very ancient custom. Eggs have played an important part in Easter celebrations since the dawn of the first century when the early Christians presented eggs to each other as symbolical of the Life within the Tomb. Egg rolling has been traced to have taken a part in European Easter festivals. And from Europe, of course, it came to America. It was in vogue in the village of the New England States in the olden times, when the people gathered on the green and watched the hard-boiled eggs bounding down the hillside, greeting the owners of the victorious eggs with cheers and laughter. In those days the eggs were afterwards eaten with vegetables and bread, washed down with copious draughts of nut­brown ale, and the day wound up with a merry dance. 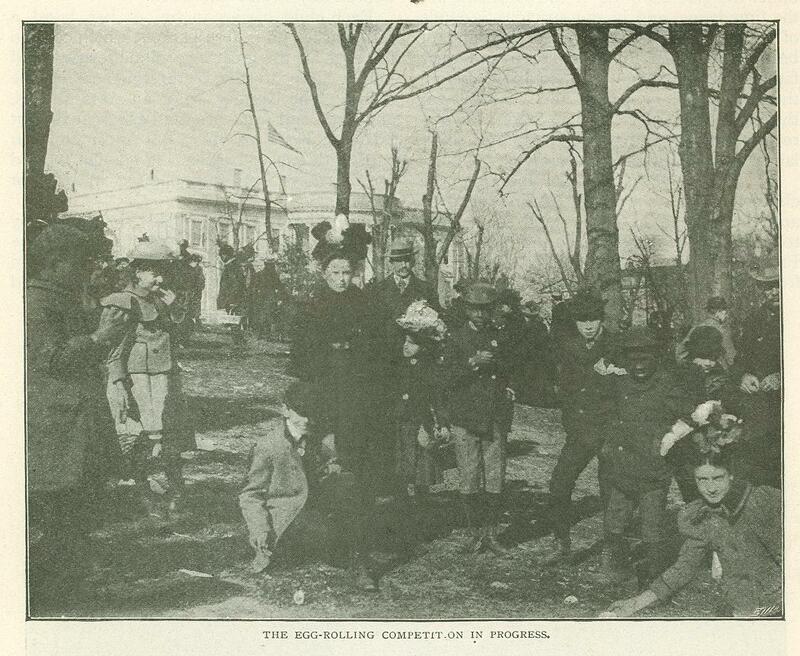 Many years ago the children of East Washington revived the custom of their great grandfathers, and on Easter Mondays visited the Capitol grounds to roll their eggs. Year by year the crowd increased, until there was hardly room enough for the youngsters to enjoy their sport. Moreover, so many little feet scampering o'er the ground de­stroyed the grass, and the police stepped in and prohibited the practice. There was keen disappointment amongst the city's children until kind President Hayes came to the rescue and gave them permission to roll their eggs in White Lot, the spacious and pretty gardens of White House. Since then Washington's children. have used the White House grounds for rolling their eggs, and it would certainly be hard to find a place more admirably adapted for the purpose, for White Lot is full of little hillocks and grassy slopes which make ideal race courses for the egg contests. President Hayes's kindly action on behalf of the children served to attract the parents. Whereas formerly they had been content to let their children roll eggs unfettered by parental control, they now accompany the youngsters to the precincts of the Presidential mansion, and during the last half dozen years the Easter Monday visit has become a great national event in the capital. President Harrison added another inducement to the grown-ups to come: he ordered the Marine band to play in the grounds during the afternoon. Sousa was then the conductor of the band, and the crowd was enormous. As it was impossible to roll eggs whilst so many people were about the children held their festival in the morning and romped about in the afternoon whilst the elder ones promenaded to the band. At one time the President held a reception of the children in the East Room of White House, but owing to the enormous crowds which thronged the Executive mansion the feature had to be abandoned. The dis­appointment was great, but the strain on the President was greater. Mr. and Mrs. McKinley watch the fun from the windows of their private apartments, and generally invite friends to enjoy the sight with them. On Easter Monday last the crowds of children rolling eggs and romping and dancing on the lawn was unprecedented. In the afternoon the people had flocked into White Lot in such numbers that there was no room for more, and hundreds were turned away. The scenes were extremely pretty, the colored people being in great force in gorgeous spring costumes. 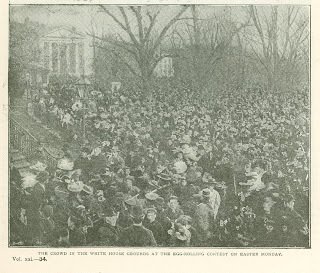 The President and Mrs. McKinley watched the crowd for several hours, and when they made their appearance on the balcony the thousands of little child­ren gave them a splendid ovation. Originally published in The Strand Magazine. April 1901.